One of the most effective ways to educate students on the importance of pollinators and pollinator habitat is via school gardens. However, these types of projects have two major challenges: 1) funding and 2) continued support & maintenance. We hear time and time again about school gardens that have been abandoned and have become an eye sore. We also hear from educators who want to implement school gardens, but lack the funding, guidance and resources to do so. Our Okies for Monarchs outreach/education team took these challenges on head first to devise solutions. One of the outcomes is a school garden grant program that not only provides funding, but also training, guidance, and curriculum. The Oklahoma City Zoo and Botanical Garden piloted this program last year allowing our team to work out the kinks and polish it up. We are excited to announce the grant has just launched the application process for 2019 and we are looking for schools in the OKC metro area who want to participate! 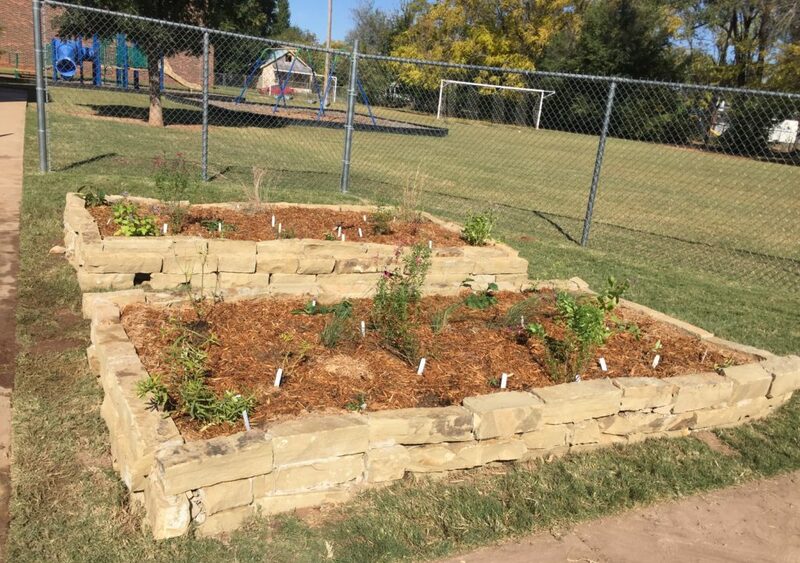 Mark Twain Elementary’s monarch garden installed in October 2018. Eligible applicants include public, private, and charter K-12 schools in the Oklahoma City metro area: Oklahoma City, Edmond, Yukon, Mustang, Moore, Midwest City, Del City, Norman, Bethany, Piedmont, Deer Creek, Choctaw, and Warr Acres. The maximum award amount is $1500 and funding may be requested for: plants (not seeds), mulch, soil, lumber and hardware for raised beds, gardening tools, gloves, pathway materials, and signage. While the grant program itself helps address the funding challenge, we still have one more to conquer: continued support and maintenance. To address it, our grant awardees will also receive the following support to make this dream into a continued reality. Assigned contact person from the Oklahoma Monarch and Pollinator Collaborative to provide guidance. While this grant opportunity is limited to the OKC metro area, it is our hope that it will inspire others to take action and do something similar for other parts of the state. If you know of a business, organization or other entity interested in sponsoring a similar program, don’t hesitate to reach out to us. We’d be happy to share the program framework and the lessons we’ve learned through this process. Share this awesome opportunity with your education friends! Application deadline is April 1, 2019. Additional details and the application are available on the OKC Zoo web site. REBECCA SNYDER is the Curator of Conservation and Science for the Oklahoma City Zoo and Botanical Garden. Not only is she passionate about monarchs and pollinators, but she also has a heart for big, furry animals such as bears. Rebecca serves as the Chair for the AZA Bear Taxon Advisory Group and Chair for the AZA Giant Panda Conservation Foundation.